I am one happy guy who is full of life and does everything in a big way! When I greet you, I may bury my head right in for some scratches. I am a happy, loving dog who wants nothing more than just to be with you. 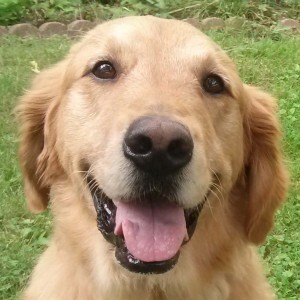 I am a typical golden who will be your shadow and lay near you and love any attention you will give me. I have a lot of energy and would love an energetic family. I will need a fenced in yard as I love to watch for open doors and will dash out and run around the neighborhood when given the chance. I love being outside and will lay on the porch taking it all in. I am fascinated by squirrels, birds and rabbits too. I love everyone I meet; dogs, people young and old. I am a quick learner and basic obedience commands are quite easy for me. I am learning how to walk nicely on a leash too. I used to spend a lot of time in a crate, now I am not too fond of being put in one. A family that is home a lot would be my perfect life. Are you ready for a fun loving, energetic boy to brighten your days?